I love Pam Wedgwood’s approach – very appealing music that gives a sense of achievement. These books look great! Just started teaching so would love more repertoire. Can you believe that Wedgwood family?! So prolific! I’d love to have something of Pam’s. One of the benefits of joining in on this webiste has been hearing music from across the Pond that isn’t widely known here. And happy to have a chance to help spread it here! I played from one of these the other day at someone’s house and it was fun, so it would be good to be able to explore more of it. Good to hear of this resource. I teach adult students classical music using the Faber Adult Piano Adventures books so Pam’s “Classic” book may be a great segue to use after students have completed those 2 volumes. I teach mainly adults and Pam’s books would be a very welcome addition to my resources for them! I use Pam Wedgwood’s It’s Never Too Late to Play Piano with some of my adult beginners, which contains some lovely pieces and arrangements, so I’m very interested in seeing these. I’m not familiar with her music, so I would love to try it. I’ve got several adult pupils who would just love these books! How do I enter the competition ? them instruction … The older boy is autistic. I just bought my first book by her. Would love to try these too. what a great combination of styles and songs. Love to have them! These books look really great. Love Pam Wedgwood books!! Teach adults as well as children so would love to win. Winning these books would give me a great way to try out! The titles are perfect, Never Too Late… wish I would have thought of it! I’m teaching at a retirement center one day a week, and they would LOVE these! I have the Show Tunes book and it’s great! I use it quite a lot and would love to try another, particularly the classical one. I would use these books with numerous adult students. They would be so excited to learn this music. I am anxious to explore these new (to me) publications. 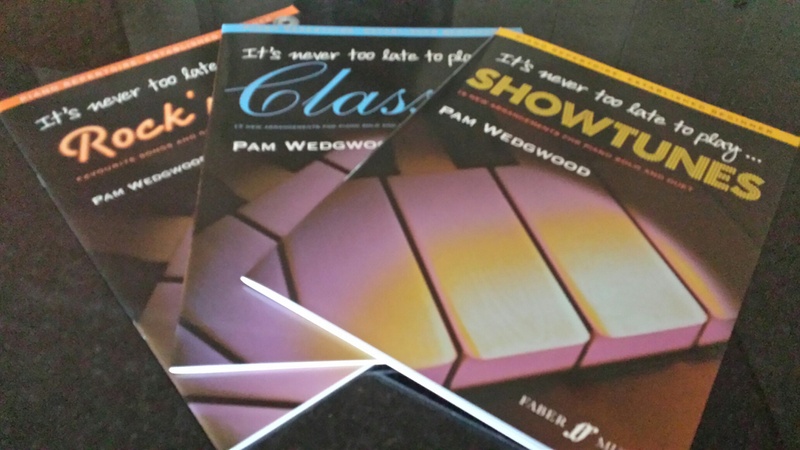 Use a lot of Pam Wedgwood music for teaching – would love one of these for my adult students! I didn’t know that some of these existed so would love to explore further with my adult & teenage pupils. Always looking for as much repertoire as possible! These look interesting. Thanks for introducing us to them! Looks fun. Would love to try it with my adult student. After viewing these books at an event hosted by Pamela Wedgwood, I can say that these three specialist books really motivate learners as they home in on a specific style of music they already love. It is sure therefore to develop their playing skills further! I would dearly love to win one of these books, Melanie!